Looking for candidates who have excellent communication skills, are self-motivated, well-organized and have outgoing personalities to be the “friendly and helpful face of Hayward”, representing the Hayward Lakes Visitor and Convention Bureau (HLVCB), the Hayward Area Chamber of Commerce (HACC) and the Hayward area in general to residents and visitors alike. Greet and welcome all visitors, answer their questions, provide directions (you will work with maps a lot! ), and make recommendations for recreation, dining, lodging, etc. as requested. You will be asked for information about anything and everything in this job. Assist with office communications including: phone switchboard, email accounts, and daily mailings. Assist with Chamber of Commerce sales of Gift Certificates, Musky Festival merchandise and event tickets. Document sales and close out the cash register daily. Assist with setup and removal of weekly “Adver-tease” displays. Help to maintain a clean and orderly public space for the visiting public. Keep shelves and displays neat and well-stocked. Order replacement publications and office supplies as needed. 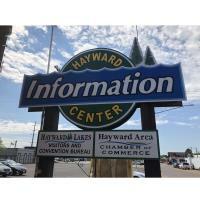 This position is jointly employed by the Hayward Lakes Visitor and Convention Bureau and the Hayward Area Chamber of Commerce on a 50:50 basis. If interested, please stop by to pick up an application at the Hayward Information Center (Monday through Friday, 9am to 5pm).